Has The Global Run On Silver Begun? Shortages Of Silver On The Horizon? The situation in the silver market seems to point to the beginning stages of a GLOBAL RUN ON SILVER. Has The Global Run On Silver Begun? Shortages On The Horizon? The situation in the silver market seems to point to the beginning stages of a GLOBAL RUN ON SILVER. I say, “it seems to point to a RUN on silver” due to several indicators I am looking at. 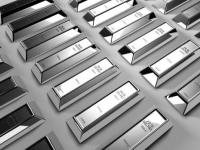 This also may force the global silver market to suffer shortages in the future. Why? Well, let’s take a look at these different indicators. 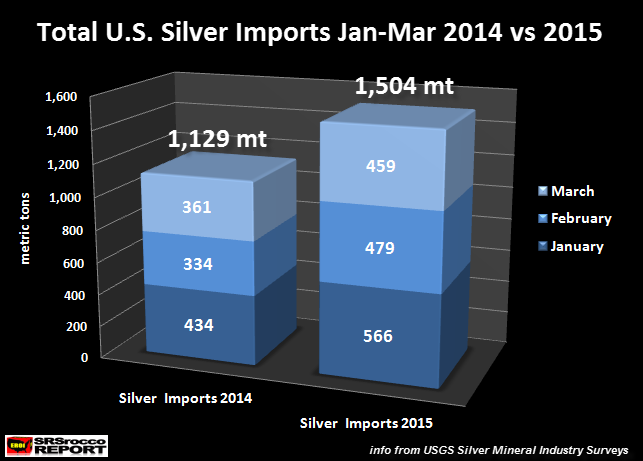 U.S. silver imports are 33% higher than the first quarter of 2014. If we consider industrial silver demand, Silver Eagle sales and the Comex Silver Inventories, the U.S. Silver Market did not require an additional 375 mt of silver. Industrial silver demand was probably lower due to a falling U.S. Q1 GDP. Silver Eagle sales were actually less the first quarter of 2015 compared to 2014 and total Comex silver inventories didn’t change all that much. So, what gives? If the U.S. Silver Market needs less silver than it did during the first quarter of 2014, someone must be stockpiling silver. There has been speculation that JP Morgan may be one of the big buyers. If they are, they are buying bullion bars and not Silver Eagles or Maples. Furthermore, I do believe there are hedge funds and individuals coming in and buying huge amounts of Silver Eagles. This is probably due to the increased financial turmoil stemming from the Greek situation. 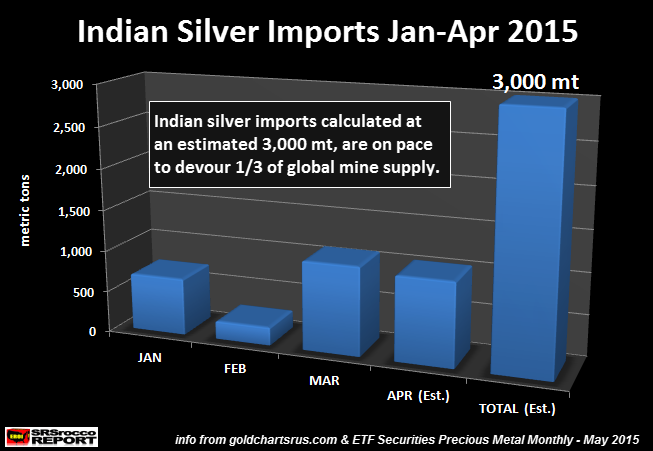 Secondly, India is importing the MOST SILVER EVER. As I mentioned in another article, INDIAN SILVER IMPORTS: On Track To Smash All Records, India imported a massive 3,000 mt in the first four months of the year. If this trend continues, India will import a whopping 9,000 mt in 2015, surpassing its previous record of 7,000 mt in 2014. I would imagine if the world suffers a financial contagion resulting from the Greek “NO” vote, we could see Indian silver bullion imports pick up even more in the second half of the year. This could cause more stress on already tight silver market. …. However, look at that red cobasis line go. It was a mere 7 basis points last Friday. It ended this week at 100 bps. The cobasis of farther-out contracts also rose proportionally. Suddenly, the silver market is firm. We can name two reasons why the cobasis might skyrocket. One is that there is a risk. If your counterparty defaults, then you don’t get your metal back. You may get dollars. The exchange will insist the dollars are equivalent to the metal, but that’s small consolation. We do not believe this is the main problem now, because it’s not occurring in gold. If the banks were in imminent danger, the gold basis would not be quiescent. The other possible reason is that there’s a growing shortage of silver. Of course, in order to decarry silver, you have to have the metal. If it’s not available, you can just wistfully watch the rising cobasis. Basically, Keith believes the rising cobasis (in RED) is a result of a tightness in the silver market. He goes on to say this is the present condition, but that could change in the future. Well, I don’t see conditions in the Global Financial Arena getting any better going forward. I believe hedge funds and individual buyers are finally figuring out the market is getting OUT-OF-HAND and are placing wise bets by purchasing physical silver. This can be seen in the huge increase in Silver Eagle buying. Sales of Silver Eagles spiked in June to 4.8 million oz (Moz) compared to 2 Moz in May. Furthermore, sales continue to be very strong at 1.6 Moz for the first week of July. If sales of Silver Eagles remain elevated for the rest of the month, we could easily see over 5 Moz sold in July. Gold Eagles for the first week in July are already 21,500 oz compared to 76,000 oz in June. 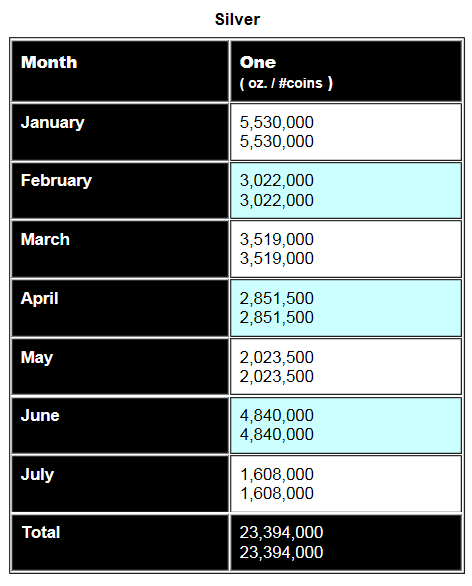 Moreover, first week July sales of 21,500 oz are the same amount sold for the entire month of May. Clearly, we can see that investors are becoming increasingly worried about financial turmoil and possible black swans stemming from the Greek-Exit situation. 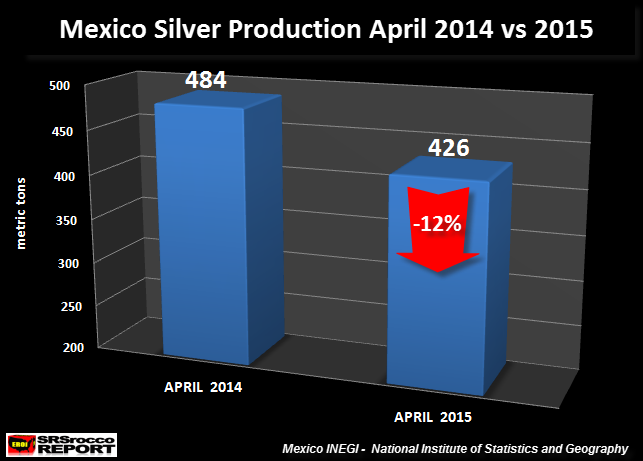 Mexico’s total silver production for the first four months of 2015 is 1,801 mt compared to 1,893 mt last year (down 5%). While Peru’s silver production is higher for the year, another large producer is down considerably. Thus, silver production from the top producers in the first 3-4 months of 2015 is down compared to last year. I will do an update on this in a separate article. One of the most important factors in the SUPPLY-DEMAND situation for silver has to do with Net Government Silver Sales. This chart is from my new report called THE SILVER CHART REPORT. It is listed as Chart #43 of a total of 48 charts in the report. It is a must read for the new and experienced precious metal investor. As we can see in the chart, net government silver sales were the highest in 2003 at 88.7 Moz. 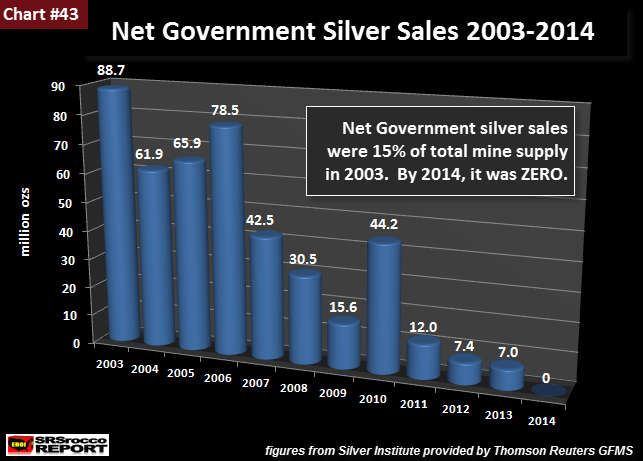 Net government silver sales accounted for 15% of total mine supply in 2003. During the following years, net government silver sales continued to decline (except for the spike in 2010) and in 2014 were a big PHAT ZERO. While Russia, China and India were the main sources of net government silver sales, China was by far the largest supplier in the group. Now, the KEY FACTOR to understand why China stopped selling its government silver stocks into the market is stated in THE SILVER MARKET REPORT. I have to say, I was quite surprised to read the reason China wanted to hold onto to its remaining government silver stocks. If you want to find out why, you have to read the report. I believe the world is in the beginning stage of GLOBAL RUN ON SILVER. The indicators listed above show something has changed in the global silver market. If the financial situation continues to unravel due to a GREEK EXIT of the European Union, demand for silver will only increase. Thus, the market will likely experience global silver shortages. Unfortunately, this will come at a time when most are waking up to the fact that they are the BIGGEST PAPER BAG HOLDERS in history and there won’t be much physical silver to go around. If you haven’t checked on THE SILVER CHART REPORT, there’s a great deal of information on the Silver Industry & Market not found in any single publication on the internet. I use this bird’s-eye approach when I create my easy to understand charts. 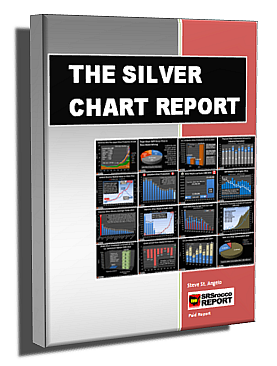 The Silver Chart Report is a collection of my top silver charts from articles published over the past six years, and includes in-depth, never-before-seen charts and content that indicate that silver is on the rise. There are 48 charts in the report, broken down in five sections.